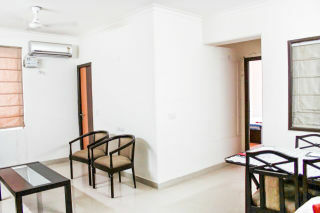 Situated on the outskirts of the city, this is an offering of a private room in an apartment, ideal for a small group. 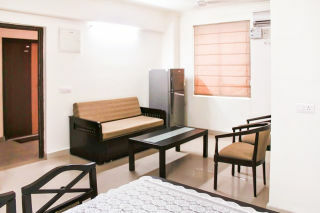 The property is located 12 km away Jaipur Airport, and the room on offer can accommodate three people. 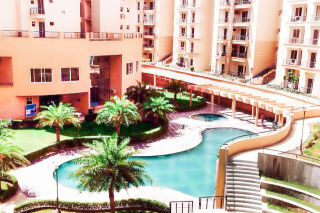 Your Space This apartment is part of a gated colony and is fronted by an inviting swimming pool, so you can unwind and take a relaxing dip after a tiring day. 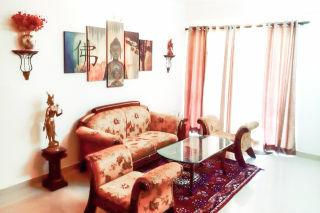 The living room is furnished with a comfy sofa set and a glass-topped coffee table for your convenience. The dining room has ample seating to ensure you enjoy all your meals comfortably. The living room opens out to a living room, so you can enjoy your morning beverage in the fresh air of the city. 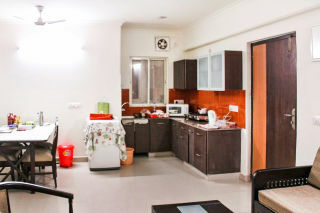 The kitchen has basic amenities for you to relish a tasty home-cooked meal! 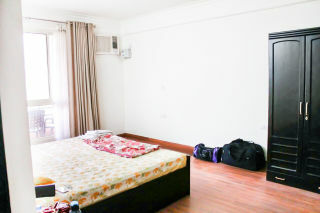 The room on offer is furnished with a fluffy double bed, two bedside tables, and a spacious wardrobe. The en suite washroom is tiled and well appointed with western sanitary ware and modern fixtures.